I learned a long time ago that what the arts know best is the human spirit. While not every movie, painting, poem, ballet or song will stir our souls, some do. There does not even have to be a religious word in the title for a work of art to give us a spiritual message. So, which film do you think deserves an Academy Award tonight? Thanks to the discovery of correspondence between the King and his therapist Lionel Logue, we learn something else about these two characters. The monarch and the commoner became very good friends. Their relationship which was tense in the beginning is exactly what gave the King courage when it came time to give the speech of his life, leading his country at the outset of World War II. How many of us find ourselves in a similar situation; not being able to find our own voice when trying to express ourselves, talk about our troubles, describe our dreams, share our needs and expectations with someone else, anyone else? Many people are prohibited from doing so. As we watched the revolutions in Tunisia and Egypt we saw how previously suppressed voices took to the streets and squares to topple powerful dictators. The rippling effect is now apparent in other Middle East countries and on a global level. Close to home we hear the protests in Wisconsin, Ohio, Indiana and on the front steps of our own capitol. Uprisings in distant lands and the King’s stammering remind us that finding courage to speak our own voice can be a painful process. It begins with believing in ourselves; having a good self image. Finding our identity is helped when others accept us for who we are, unconditionally, at home, in school or at work. It means parents affirm their children, employers respect their workers, teachers help students build up confidence. The Israelites in exile felt their voices were not being heard. Believing they were abandoned by God they began to seek alternative protection. The prophet Isaiah urged them not to be so faithless. He told them God does love them like a mother who would not forget to nurse her children. What a wonderful image of God who listens to our cries and cares for us. Psalm 62 imagines God to be a fortress that protects people from all harm. We find a similar narrative in Matthew’s gospel. While this speech from the sermon on the mount specifically addresses material possessions, it suggests there is little to worry about in life if we have faith in and a good relationship with a nurturing God. Our relationships on earth begin with God. That nurturing God sustains us and gives us an identity. Seek first the kin-dom of God and everything else will be all right. Me: Do you believe that? That if you believe in God everything be will be OK? Me: Again, do you believe that? Me, as if puzzled by the answer: Really? Me: Let me see if I understand. So if you have faith in God everything is going to be all right. Pause. Ah, hah. However, it’s one thing to say the birds in the air and flowers in the fields have nothing to worry about. It is another thing when people have no food, no shelter, suffer discrimination and injustice and are shot in the streets of their own homes. So, this gospel can be a difficult one to grasp even for those with abundant faith. Belief in a good God alone does not immediately erase the problems in the world. The Israelites were on a long arduous odyssey searching for the Promised Land. Many generations later, we are still not there. Where is that land of milk and honey? Do we become cynical? Doubtful? No. Like our ancestors we do not give up. We continue the journey of the Jewish Jesus to make life peaceful and just for all. Is it safe to presume, then, that is why we are here this morning. We are here not just to hear beautiful music, not just to hear a decent sermon, not just to take communion, but to find ways to advance God’s kin-dom. In the face of unrelenting odds we are called to a life framed by determination, a stubborn desire to be courageous, to make our voices heard, to stand up for our rights. We are also commissioned by our baptism to help those who have no voice, those who have been put down in society. King George VI came to trust and befriend an unorthodox therapist who believed in the King. That sustenance gave the monarch the courage and strength to speak. Our constitutional right to freedom of speech is also a biblical right that needs to be respected and protected in our Church, by our Church. EVeryone of us has a right to speak up in church and state. Our relationship, our friendship with God is what gives us an identity. It is a self image that flourishes whenever you and I help each other to have faith in our own voices. Homily for February 13, 2011 – Who’s Your Valentine? World Marriage Day today and Valentine’s Day tomorrow provide a time for us to consider the freedoms we have, or do not have, in developing and maintaining relationships. Here’s an example. Catherine Burgess, one of our younger parishioners, a student at the College of the Holy Cross, was in Kenya recently. There she worked with the Bride’s Research Project  that helps young Kenyan women, who are forced into arranged marriages, get back on their feet with schooling and jobs. Catherine’s mother Kate told me, in so many words, those marriages are based on the laws of the tribe. They are not based on freedom neither in the intent that they were entered into, nor perhaps in the respect the spouses have for each other’s continued growth as a person in the eyes of God. As we listened to the Word of God this morning what crossed our minds about our own free will and the will of God? Are we free to do what is pleasing to us alone? How do the choices I make affect the lives of others? How do civic and religious customs and laws help or hinder those choices? How do we know what God’s will is in such situations? Where does freedom exist in a community like this one where, as another parishioner wrote: we have cheered each other on and consoled one another at the most difficult crossroads of our frail lives? This raises some questions. What are we to do with civic laws that prevent people from using their free will? What about church laws that make it difficult to end a marriage that is not working no matter how hard the couple tries? What about gay and lesbian people who want the same civil rights in their partnerships as others have in marriage? The bible tells us God created us and left us the power of our own free choice. (Sirach 15:14) The grace of Christ does not rival our free will when we collaborate with Christ in making the world free. The commandments and civil laws that guide us and protect our freedoms are based on human rights. We question them when they are not. The principles of free will that govern our choices about human relations are compromised whenever someone is held captive — physically or emotionally — whether in our own homes or in other countries. By working for the freedom of others we safeguard our own free will, a gift from God. World Marriage Day, Valentine’s Day and the Word of God remind you and me to strive for relationships based on freedom. They urge us to work for civil and religious laws that honor every person’s free will to grow in the relationships of their choosing. 4 Pilch, John. The Cultural World of Jesus, Sunday by Sunday, Cycle A (Collegeville: Liturgical Press) 1995, 34-36. 5 Fuller, Reginald and Westberg Daniel. Preaching the Lectionary:The Word of God for the Church Today (Collegeville: The Liturgical Press. 2006 (Third Edition) pp. 128-130. Richard S. Vosko, Ph.D., Hon. 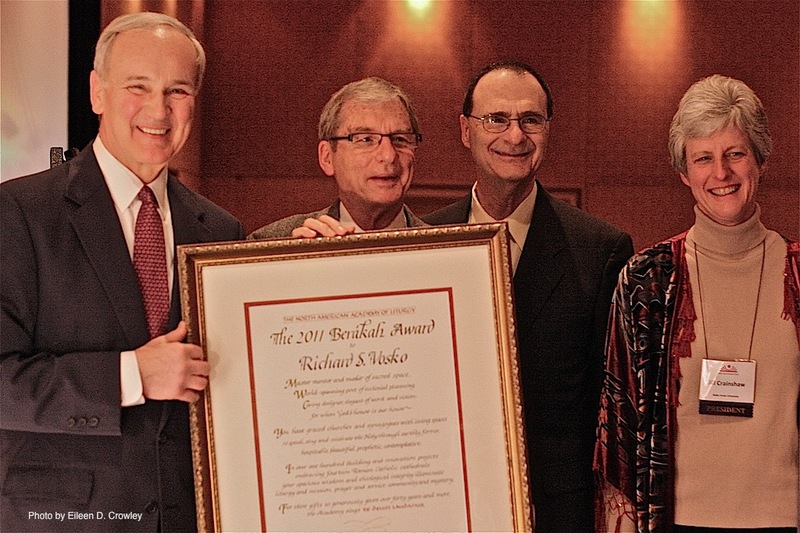 AIA received the Berakah Award, the highest honor given by the North American Academy of Liturgy on January 9, 2011 in San Francisco, CA. Vosko was recognized for his liturgical scholarship and award winning contributions to sacred art and architecture. A priest of the Roman Catholic Diocese of Albany, Vosko has worked for forty years as a sacred space planner collaborating with Catholics and Jews throughout North America in creating places for worship. His work is well known internationally. The North American Academy of Liturgy is an international and inter-religious organization composed of scholars, artists and musicians. It was organized in December 1973, ten years after the promulgation of the Constitution on the Sacred Liturgy of the Second Vatican Council. Vosko is a founding member. The Academy’s purpose is twofold: To promote liturgical scholarship among its members through opportunities for exchange of ideas, and to extend the benefits of this scholarship to the worshiping communities to which its members belong. Categories: Religious Art & Architecture, Uncategorized, Vatican Two | Permalink.